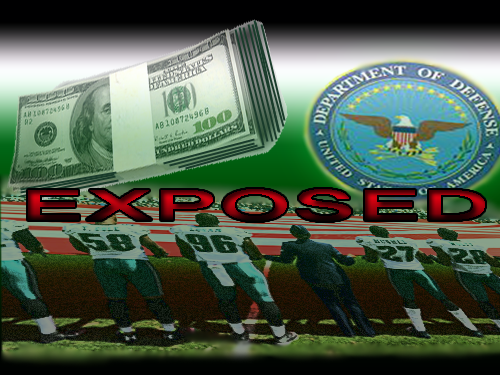 Sports Military Worship Propaganda Exposed- Senate Report Admits Millions Spent On Psyop! A Senate oversight report just blew the lid on the U.S. military worship ceremonies we all see at sporting events all over the United States. We see this military worship all the time at college and professional sports events. These staged ceremonies are designed to psyop young men and women into joining the military. They are also designed to sell war and make young adults think that the road to honor goes through a military lifestyle. Sports fans have no idea they are being bombarded with lies and propaganda bankrolled by the Pentagon and the National Guard. The recent Senate report blowing the lid on this psyop campaign labels the paid for propaganda as "inappropriate and frivolous". The report reviewed contracts between the Pentagon (and National Guard) and sports teams and admittedly labels two thirds of the contracts as "paid-for-patriotism". Yeah, I'll say. Every trick from flag ceremonies, national anthems, ceremonial first pitches, puck drops, color guard presentations even reenlistment ceremonies have been quietly paid for to deceive the sports fans into wanting to join the military. I would add that even though it's not mentioned in the article referenced let's not forget the pro-military commercials sports fans are forced to watch before viewing team highlights or the cleverly positioned banners on sport websites. The propaganda is everywhere. "It is troubling to learn that taxpayer funds are being used to compensate these teams for honoring and recognizing U.S. military service members,"
"thanks to an in-depth investigation, a lot of that patriotism was paid for"
When John McCain himself admits that the Pentagon is propagandizing sports fans, that shows you how blatant and undeniable the propaganda is. The questions we should be asking is why is the Pentagon not cooperating? And, is anyone surprised by this? I'm not. Most people don't realize the Pentagon has an endless supply of money through something called "Overseas Contingency Operation" (OCO) which was set up after 9/11. In this uncapped money siphoning scheme called the "Pentagon Slush Fund" billions of dollars can be siphoned from tax payers to pay for endless wars. For example the phony war against their own proxy army, ISIS, allows the Pentagon to siphon $10 million per day or $8.6 billion annually! Are you beginning to see the bigger picture? So when sports fans are at stadiums watching all these staged ceremonies, they don't realize it's a paid-for psyop to fool young adults into joining the military to fight in bankers wars, feed the war profit machine and justify billions into their endless budget. There is no honor or integrity in this. Who knows what is in those hidden agreements which the Pentagon refuses to disclose. Are there illegalities reflected in them? Is there something far more nefarious going on that they don't want anyone to see? Let this be a wake up call to all sports fans. Let sports fans know there is a war on for their minds and the Pentagon is paying millions from an endless fund of money to brand their war machine and steal the minds of young adults. It's time sports fans and the general public hold team owners responsible for accepting money that funds the U.S. war machine. The individual teams that are taking money from the Pentagon should be exposed and held accountable. Let's stop the nationwide psychotic military worship once and for all. Let's stop portraying military personnel like they are fearless gods that need to be worshipped and let's call this evil for what it is. Let's hit the military and the Pentagon with the truth they don't want to hear. That everyone in the Military is an order following slave. The question is how many people in the military will follow orders without considering if the order is lawful and moral? Very few if any because the U.S. military is a machine that weeds out conscientious soldiers. They want and need brainwashed order followers that won't question the morality of the mission. The U.S. military is arguably the greatest threat to humanity today even though there are many well meaning men and women in it. I know because I was in the military and I meant well when I served so I know this is a real phenomenon. It's also impossible to know what is in someone's heart. However the thing that we know for sure is that the U.S. military is a tool for the global elite to execute the plans. There's no getting around it. This is the reason why Obama has fired so many senior military commanders in the past 7 years. Getting rid of the true honorable men and replacing them with obedient immoral slaves. Let this serve as a warning to all military. The military apparatus serves as a tool for evil to the elite and it seems that will never change. This is why they need to pay for their propaganda intended to deceive sports fans into serving their killing machine. It's time to say no to the killing machine. Say no to the Pentagon's killing machine dressed as honorable and godly. There is nothing honorable, godly or moral about participating in immoral wars of aggression which are all based on government lies. And if sports teams refuse to acknowledge this then don't support them. Take a stand and see the sports mind control psyop for what it is.